What Day Of The Week Is May 27? 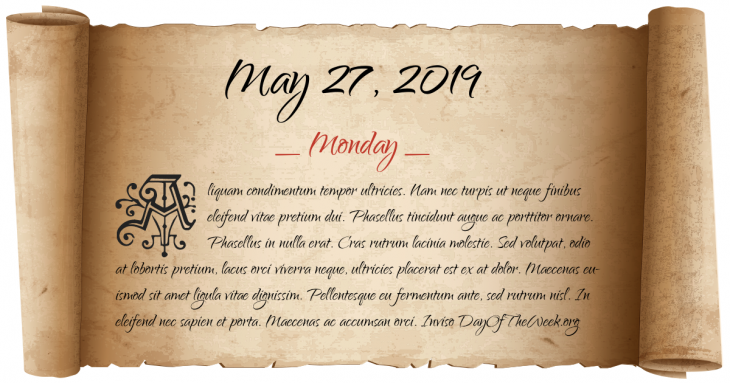 May 27, 2019 is the 147th day of the year 2019 in the Gregorian calendar. There are 218 days remaining until the end of the year. The day of the week is Monday. The F4-strength St. Louis-East St. Louis Tornado hits in St. Louis, Missouri and East Saint Louis, Illinois, killing at least 255 people and causing $2.9 billion in damage (1997 USD). The Ford Motor Company ceases manufacture of the Ford Model T and begins to retool plants to make the Ford Model A. World War II: In the Le Paradis massacre, 99 soldiers from a Royal Norfolk Regiment unit are shot after surrendering to German troops. Two survive. World War II: In Operation Anthropoid, Reinhard Heydrich is assassinated in Prague. The Centralia, Pennsylvania mine fire starts. Who were born on May 27?